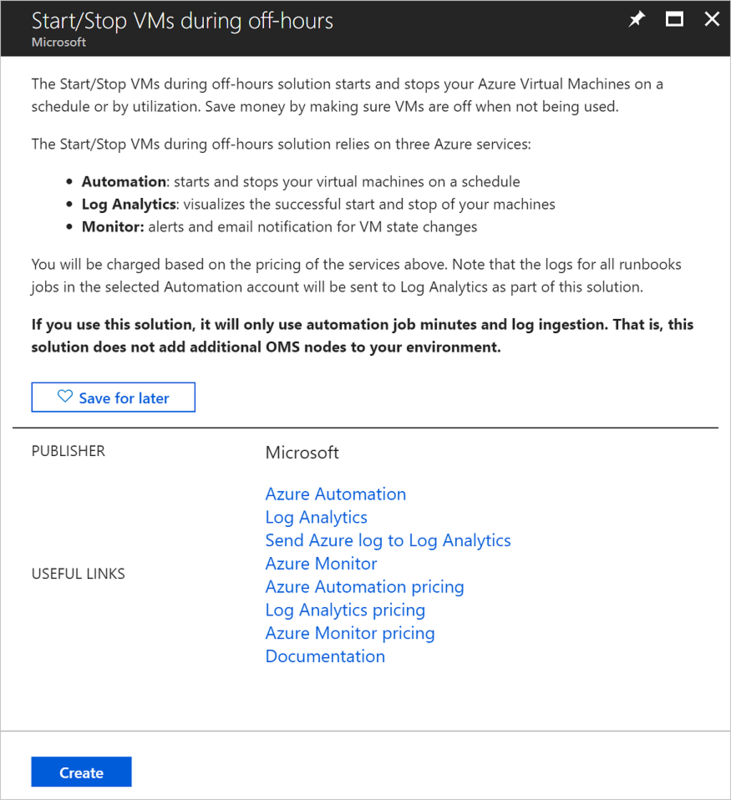 The Start/Stop VMs during off-hours solution starts and stops your Azure virtual machines on user-defined schedules, provides insights through Azure Monitor logs, and sends optional emails by using action groups. It supports both Azure Resource Manager and classic VMs for most scenarios. Autostop VMs based on low CPU usage. 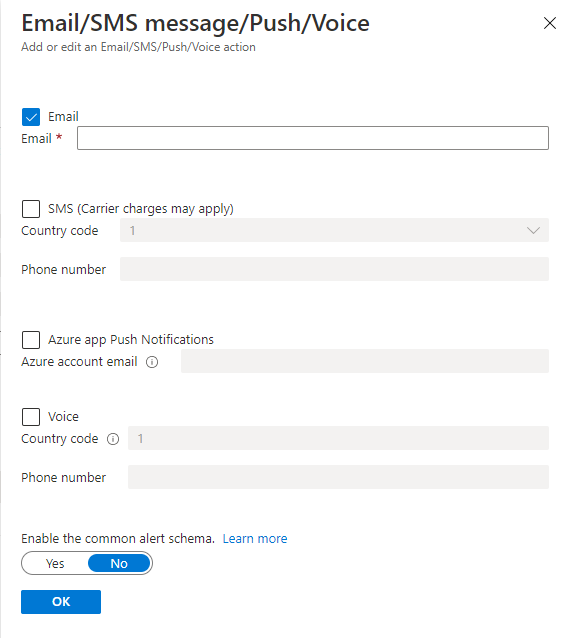 This solution manages VMs in any region, but can only be used in the same subscription as your Azure Automation account. This solution is available in Azure and AzureGov to any region that supports a Log Analytics workspace, an Azure Automation account, and Alerts. AzureGov regions currently do not support email functionality. If you are using the solution for classic VMs, then all your VMs will be processed sequentially per cloud service. Virtual machines are still processed in parallel across different cloud services. Azure Cloud Solution Provider (Azure CSP) subscriptions support only the Azure Resource Manager model, non-Azure Resource Manager services are not available in the program. When the Start/Stop solution runs you may receive errors as it has cmdlets to manage classic resources. To learn more about CSP, see Available services in CSP subscriptions. If you use a CSP subscription, you should modify the External_EnableClassicVMs variable to False after deployment. The runbooks for this solution work with an Azure Run As account. The Run As account is the preferred authentication method, because it uses certificate authentication instead of a password that might expire or change frequently. It is recommended to use a separate Automation Account for the Start/Stop VM solution. This is because Azure module versions are frequently upgraded, and their parameters may change. The Start/Stop VM solution is not upgraded on the same cadence so it may not work with newer versions of the cmdlets that it uses. It is recommended to test module updates in a test Automation Account prior to importing them in your production Automation Account. Perform the following steps to add the Start/Stop VMs during off-hours solution to your Automation account, and then configure the variables to customize the solution. You can also create it from anywhere in the Azure portal, by clicking Create a resource. In the Marketplace page, type a keyword such as Start or Start/Stop. As you begin typing, the list filters based on your input. Alternatively, you can type in one or more keywords from the full name of the solution and then press Enter. Select Start/Stop VMs during off-hours from the search results. The Add Solution page appears. You are prompted to configure the solution before you can import it into your Automation subscription. Specify a name for the new Log Analytics workspace, such as "ContosoLAWorkspace". Select a Subscription to link to by selecting from the drop-down list, if the default selected is not appropriate. For Resource Group, you can create a new resource group or select an existing one. Select a Location. Currently, the only locations available are Australia Southeast, Canada Central, Central India, East US, Japan East, Southeast Asia, UK South, West Europe, and West US 2. Select a Pricing tier. Choose the Per GB (Standalone) option. Azure Monitor logs has updated pricing and the Per GB tier is the only option. After providing the required information on the Log Analytics workspace page, click Create. You can track its progress under Notifications from the menu, which returns you to the Add Solution page when done. In the Name field, enter the name of the Automation account. All other options are automatically populated based on the Log Analytics workspace selected. These options cannot be modified. An Azure Run As account is the default authentication method for the runbooks included in this solution. After you click OK, the configuration options are validated and the Automation account is created. You can track its progress under Notifications from the menu. Finally, on the Add Solution page, select Configuration. The Parameters page appears. Specify the Target ResourceGroup Names. These values are resource group names that contain VMs to be managed by this solution. You can enter more than one name and separate each by using a comma (values are not case-sensitive). Using a wildcard is supported if you want to target VMs in all resource groups in the subscription. This value is stored in the External_Start_ResourceGroupNames and External_Stop_ResourceGroupNames variables. Specify the VM Exclude List (string). This value is the name of one or more virtual machines from the target resource group. You can enter more than one name and separate each by using a comma (values are not case-sensitive). Using a wildcard is supported. This value is stored in the External_ExcludeVMNames variable. Select a Schedule. This value is a recurring date and time for starting and stopping the VMs in the target resource groups. By default, the schedule is configured for 30 minutes from now. Selecting a different region is not available. To configure the schedule to your specific time zone after configuring the solution, see Modifying the startup and shutdown schedule. The default value for Target ResourceGroup Names is a *. This targets all VMs in a subscription. If you do not want the solution to target all the VMs in your subscription this value needs to be updated to a list of resource group names prior to enabling the schedules. After you have configured the initial settings required for the solution, click OK to close the Parameters page and select Create. After all settings are validated, the solution is deployed to your subscription. This process can take several seconds to finish, and you can track its progress under Notifications from the menu. If you have an Azure Cloud Solution Provider (Azure CSP) subscription, after deployment is complete, in your Automation Account, go to Variables under Shared Resources and set the External_EnableClassicVMs variable to False. This stops the solution from looking for Classic VM resources. This scenario is the default configuration when you first deploy the solution. For example, you can configure it to stop all VMs across a subscription when you leave work in the evening, and start them in the morning when you are back in the office. When you configure the schedules Scheduled-StartVM and Scheduled-StopVM during deployment, they start and stop targeted VMs. Configuring this solution to just stop VMs is supported, see Modify the startup and shutdown schedules to learn how to configure a custom schedule. The time zone is your current time zone when you configure the schedule time parameter. However, it is stored in UTC format in Azure Automation. You do not have to do any time zone conversion as this is handled during the deployment. You control which VMs are in scope by configuring the following variables: External_Start_ResourceGroupNames, External_Stop_ResourceGroupNames, and External_ExcludeVMNames. You can enable either targeting the action against a subscription and resource group, or targeting a specific list of VMs, but not both. Configure the External_Stop_ResourceGroupNames and External_ExcludeVMNames variables to specify the target VMs. Enable and update the Scheduled-StartVM and Scheduled-StopVM schedules. Run the ScheduledStartStop_Parent runbook with the ACTION parameter set to start and the WHATIF parameter set to True to preview your changes. Run the ScheduledStartStop_Parent runbook with the ACTION parameter set to start, add a comma-separated list of VMs in the VMList parameter, and then set the WHATIF parameter to True. Preview your changes. Configure the External_ExcludeVMNames parameter with a comma-separated list of VMs (VM1, VM2, VM3). This scenario does not honor the External_Start_ResourceGroupNames and External_Stop_ResourceGroupnames variables. For this scenario, you need to create your own Automation schedule. For details, see Scheduling a runbook in Azure Automation. The value for Target ResourceGroup Names is stored as the value for both External_Start_ResourceGroupNames and External_Stop_ResourceGroupNames. For further granularity, you can modify each of these variables to target different resource groups. For start action, use External_Start_ResourceGroupNames, and for stop action, use External_Stop_ResourceGroupNames. 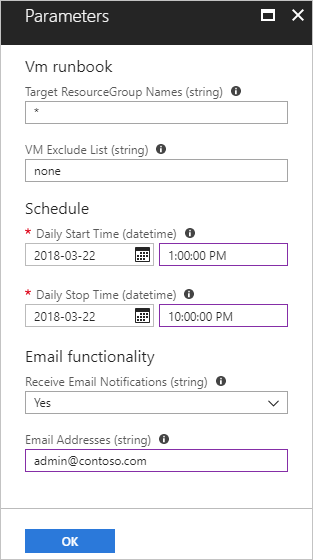 VMs are automatically added to the start and stop schedules. Add a sequencestart and a sequencestop tag with a positive integer value to VMs that are targeted in External_Start_ResourceGroupNames and External_Stop_ResourceGroupNames variables. The start and stop actions are performed in ascending order. To learn how to tag a VM, see Tag a Windows Virtual Machine in Azure and Tag a Linux Virtual Machine in Azure. Modify the schedules Sequenced-StartVM and Sequenced-StopVM to the date and time that meet your requirements and enable the schedule. Run the SequencedStartStop_Parent runbook with the ACTION parameter set to start and the WHATIF parameter set to True to preview your changes. Preview the action and make any necessary changes before implementing against production VMs. When ready, manually execute the runbook with the parameter set to False, or let the Automation schedule Sequenced-StartVM and Sequenced-StopVM run automatically following your prescribed schedule. Add a sequencestart and a sequencestop tag with a positive integer value to VMs you plan to add to the VMList parameter. Run the SequencedStartStop_Parent runbook with the ACTION parameter set to start, add a comma-separated list of VMs in the VMList parameter, and then set the WHATIF parameter to True. Preview your changes. Preview the action and make any necessary changes before implementing against production VMs. When ready, manually execute the monitoring-and-diagnostics/monitoring-action-groupsrunbook with the parameter set to False, or let the Automation schedule Sequenced-StartVM and Sequenced-StopVM run automatically following your prescribed schedule. This solution can help manage the cost of running virtual machines in your subscription by evaluating Azure VMs that aren't used during non-peak periods, such as after hours, and automatically shutting them down if processor utilization is less than x%. Enable and update the Schedule_AutoStop_CreateAlert_Parent schedule. Run the AutoStop_CreateAlert_Parent runbook with the ACTION parameter set to start and the WHATIF parameter set to True to preview your changes. Run the AutoStop_CreateAlert_Parent runbook with the ACTION parameter set to start, add a comma-separated list of VMs in the VMList parameter, and then set the WHATIF parameter to True. Preview your changes. Now that you have a schedule for stopping VMs based on CPU utilization, you need to enable one of the following schedules to start them. Target start action by subscription and resource group. See the steps in Scenario 1 for testing and enabling Scheduled-StartVM schedules. Target start action by subscription, resource group, and tag. See the steps in Scenario 2 for testing and enabling Sequenced-StartVM schedules. This solution includes preconfigured runbooks, schedules, and integration with Azure Monitor logs so you can tailor the startup and shutdown of your virtual machines to suit your business needs. The following table lists the runbooks deployed to your Automation account by this solution. Do not make changes to the runbook code. Instead, write your own runbook for new functionality. Do not directly run any runbook with "child" appended to its name. All parent runbooks include the WhatIf parameter. When set to True, WhatIf supports detailing the exact behavior the runbook takes when run without the WhatIf parameter and validates the correct VMs are being targeted. A runbook only performs its defined actions when the WhatIf parameter is set to False. WebHookURI Called from the parent runbook. This runbook creates alerts on a per-resource basis for the AutoStop scenario. WhatIf: True or False Creates or updates Azure alert rules on VMs in the targeted subscription or resource groups. VMList: Comma-separated list of VMs. For example, vm1, vm2, vm3. WhatIf validates the runbook logic without executing. AutoStop_Disable none Disables AutoStop alerts and default schedule. AutoStop_StopVM_Child WebHookData Called from the parent runbook. Alert rules call this runbook to stop the VM. Bootstrap_Main none Used one time to set up bootstrap configurations such as webhookURI, which are typically not accessible from Azure Resource Manager. This runbook is removed automatically upon successful deployment. ResourceGroupName Called from the parent runbook. Executes a start or stop action for the scheduled stop. WhatIf: True or False This setting affects all VMs in the subscription. Edit the External_Start_ResourceGroupNames and External_Stop_ResourceGroupNames to only execute on these targeted resource groups. You can also exclude specific VMs by updating the External_ExcludeVMNames variable. VMList Create tags named sequencestart and sequencestop on each VM for which you want to sequence start/stop activity. These tag names are case-sensitive. The value of the tag should be a positive integer (1, 2, 3) that corresponds to the order in which you want to start or stop. Note: VMs must be within resource groups defined as External_Start_ResourceGroupNames, External_Stop_ResourceGroupNames, and External_ExcludeVMNames in Azure Automation variables. They must have the appropriate tags for actions to take effect. The following table lists the variables created in your Automation account. Only modify variables prefixed with External. Modifying variables prefixed with Internal causes undesirable effects. External_AutoStop_Condition The conditional operator required for configuring the condition before triggering an alert. Acceptable values are GreaterThan, GreaterThanOrEqual, LessThan, and LessThanOrEqual. External_AutoStop_Description The alert to stop the VM if the CPU percentage exceeds the threshold. External_AutoStop_MetricName The name of the performance metric for which the Azure Alert rule is to be configured. External_AutoStop_Threshold The threshold for the Azure Alert rule specified in the variable External_AutoStop_MetricName. Percentage values can range from 1 to 100. External_AutoStop_TimeAggregationOperator The time aggregation operator, which is applied to the selected window size to evaluate the condition. Acceptable values are Average, Minimum, Maximum, Total, and Last. External_AutoStop_TimeWindow The window size during which Azure analyzes selected metrics for triggering an alert. This parameter accepts input in timespan format. Possible values are from 5 minutes to 6 hours. External_EnableClassicVMs Specifies whether Classic VMs are targeted by the solution. The default value is True. This should be set to False for CSP subscriptions. External_ExcludeVMNames Enter VM names to be excluded, separating names by using a comma with no spaces. This is limited to 140 VMs. If you add more than 140 VMs to this comma separated list, VMs that are set to be excluded may be inadvertently started or stopped. External_Start_ResourceGroupNames Specifies one or more resource groups, separating values by using a comma, targeted for start actions. External_Stop_ResourceGroupNames Specifies one or more resource groups, separating values by using a comma, targeted for stop actions. Internal_AutomationAccountName Specifies the name of the Automation account. Internal_AutoSnooze_WebhookUri Specifies Webhook URI called for the AutoStop scenario. Internal_AzureSubscriptionId Specifies the Azure Subscription ID. Internal_ResourceGroupName Specifies the Automation account resource group name. Across all scenarios, the External_Start_ResourceGroupNames, External_Stop_ResourceGroupNames, and External_ExcludeVMNames variables are necessary for targeting VMs, with the exception of providing a comma-separated list of VMs for the AutoStop_CreateAlert_Parent, SequencedStartStop_Parent, and ScheduledStartStop_Parent runbooks. That is, your VMs must reside in target resource groups for start and stop actions to occur. The logic works similar to Azure policy, in that you can target the subscription or resource group and have actions inherited by newly created VMs. This approach avoids having to maintain a separate schedule for every VM and manage starts and stops in scale. The following table lists each of the default schedules created in your Automation account. You can modify them or create your own custom schedules. By default, all of the schedules are disabled except for Scheduled_StartVM and Scheduled_StopVM. You should not enable all schedules, because this might create overlapping schedule actions. It's best to determine which optimizations you want to perform and modify accordingly. See the example scenarios in the overview section for further explanation. 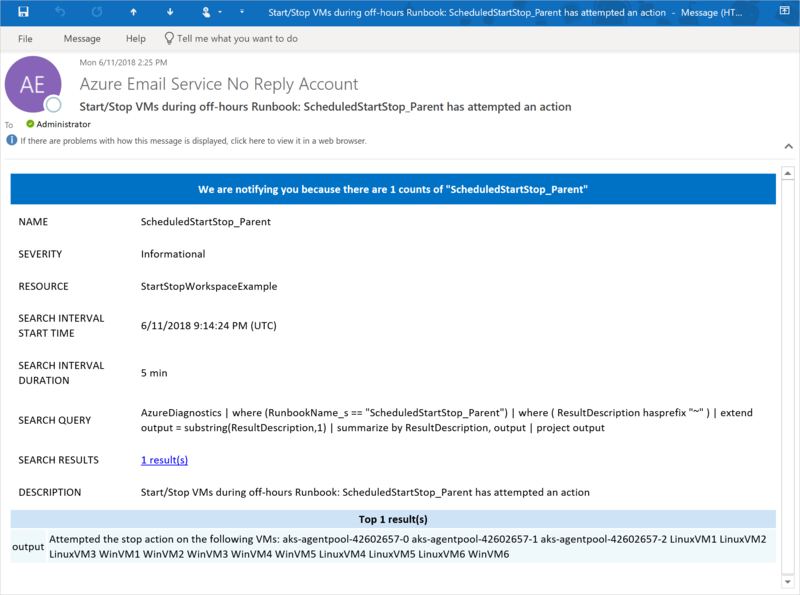 Schedule_AutoStop_CreateAlert_Parent Every 8 hours Runs the AutoStop_CreateAlert_Parent runbook every 8 hours, which in turn stops the VM-based values in External_Start_ResourceGroupNames, External_Stop_ResourceGroupNames, and External_ExcludeVMNames in Azure Automation variables. Alternatively, you can specify a comma-separated list of VMs by using the VMList parameter. Scheduled_StopVM User defined, daily Runs the Scheduled_Parent runbook with a parameter of Stop every day at the specified time. Automatically stops all VMs that meet the rules defined by asset variables. Enable the related schedule, Scheduled-StartVM. Scheduled_StartVM User defined, daily Runs the Scheduled_Parent runbook with a parameter of Start every day at the specified time. Automatically starts all VMs that meet the rules defined by the appropriate variables. Enable the related schedule, Scheduled-StopVM. Sequenced-StopVM 1:00 AM (UTC), every Friday Runs the Sequenced_Parent runbook with a parameter of Stop every Friday at the specified time. Sequentially (ascending) stops all VMs with a tag of SequenceStop defined by the appropriate variables. For more information on tag values and asset variables, see the Runbooks section. Enable the related schedule, Sequenced-StartVM. Sequenced-StartVM 1:00 PM (UTC), every Monday Runs the Sequenced_Parent runbook with a parameter of Start every Monday at the specified time. Sequentially (descending) starts all VMs with a tag of SequenceStart defined by the appropriate variables. For more information on tag values and asset variables, see the Runbooks section. Enable the related schedule, Sequenced-StopVM. Automation creates two types of records in the Log Analytics workspace: job logs and job streams. Caller Who initiated the operation. Possible values are either an email address or system for scheduled jobs. JobId GUID that is the ID of the runbook job. resourceId Specifies the resource type in Azure. For Automation, the value is the Automation account associated with the runbook. ResourceGroup Specifies the resource group name of the runbook job. ResourceProvider Specifies the Azure service that supplies the resources you can deploy and manage. For Automation, the value is Azure Automation. ResourceType Specifies the resource type in Azure. For Automation, the value is the Automation account associated with the runbook. RunbookName Specifies the name of the runbook. SubscriptionId Specifies the subscription ID of the job. Time Date and time when the runbook job executed. resourceId Specifies the resource ID in Azure. For Automation, the value is the Automation account associated with the runbook. RunbookName The name of the runbook. SourceSystem Specifies the source system for the data submitted. For Automation, the value is OpsManager. When you perform any log search that returns category records of JobLogs or JobStreams, you can select the JobLogs or JobStreams view, which displays a set of tiles summarizing the updates returned by the search. The following table provides sample log searches for job records collected by this solution. Find jobs for runbook ScheduledStartStop_Parent that have finished successfully search Category == "JobLogs"
Find jobs for runbook SequencedStartStop_Parent that have finished successfully search Category == "JobLogs"
To access the solution, navigate to your Automation Account, select Workspace under RELATED RESOURCES. On the log analytics page, select Solutions under GENERAL. On the Solutions page, select the solution Start-Stop-VM[workspace] from the list. Selecting the solution displays the Start-Stop-VM[workspace] solution page. Here you can review important details such as the StartStopVM tile. As in your Log Analytics workspace, this tile displays a count and a graphical representation of the runbook jobs for the solution that have started and have finished successfully. From here, you can perform further analysis of the job records by clicking the donut tile. The solution dashboard shows job history and pre-defined log search queries. Switch to the log analytics advanced portal to search based on your search queries. To change email notifications after the solution is deployed, modify action group that was created during deployment. Subscriptions in the Azure Government Cloud do not support the email functionality of this solution. 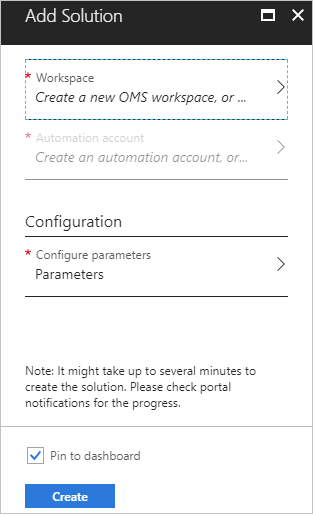 In the Azure portal, navigate to Monitor -> Action groups. Select the action group titled StartStop_VM_Notication. On the StartStop_VM_Notification page, click Edit details under Details. This opens the Email/SMS/Push/Voice page. Update the email address and click OK to save your changes. The following is an example email that is sent when the solution shuts down virtual machines. The solution provides the ability to add VMs to be targeted by the solution or specifically exclude machines from the solution. There are a couple options that you can use to make sure that a VM is included in the Start/Stop solution when it runs. Each of the parent runbooks of the solution have a VMList parameter. You can pass a comma separated list of VM names to this parameter when scheduling the appropriate parent runbook for your situation and these VMs will be included when the solution runs. To select multiple VMs, set the External_Start_ResourceGroupNames and External_Stop_ResourceGroupNames with the resource group names that contain the VMs you want to start or stop. You can also set this value to *, to have the solution run against all resource groups in the subscription. To exclude a VM from the solution, you can add it to the External_ExcludeVMNames variable. This variable is a comma separated list of specific VMs to exclude from the Start/Stop solution. This list is limited to 140 VMs. If you add more than 140 VMs to this comma separated list, VMs that are set to be excluded may be inadvertently started or stopped. Managing the startup and shutdown schedules in this solution follows the same steps as outlined in Scheduling a runbook in Azure Automation. There needs to be a separate schedule to start and to stop VMs. Ensure you have added the resource groups for the VMs to shut down in the External_Stop_ResourceGroupNames variable. Create your own schedule for the time you want to shut down the VMs. Navigate to the ScheduledStartStop_Parent runbook and click Schedule. This allows you to select the schedule you created in the preceding step. Select Parameters and run settings and set the ACTION parameter to "Stop". If you have deployed a previous version of this solution, you must first delete it from your account before deploying an updated release. Follow the steps to remove the solution and then follow the steps above to deploy the solution. If you decide you no longer need to use the solution, you can delete it from the Automation account. Deleting the solution only removes the runbooks. It does not delete the schedules or variables that were created when the solution was added. Those assets you need to delete manually if you are not using them with other runbooks. From your Automation account, select Workspace from the left page. 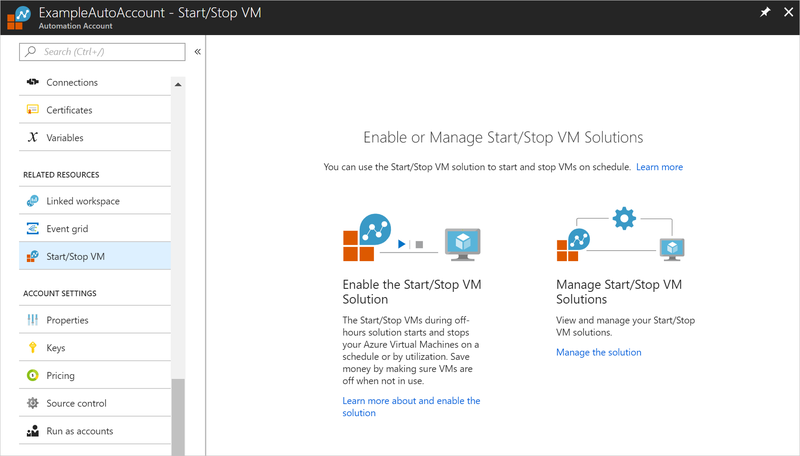 On the Solutions page, select the solution Start-Stop-VM[Workspace]. On the VMManagementSolution[Workspace] page, from the menu, select Delete. In the Delete Solution window, confirm that you want to delete the solution. While the information is verified and the solution is deleted, you can track its progress under Notifications from the menu. You are returned to the Solutions page after the process to remove the solution starts. From the Azure portal home screen, select Log Analytics workspaces. On the Log Analytics workspaces page, select the workspace. Select Delete from the menu on the workspace settings page. If you do not want to retain the Azure Automation account components, you can manually delete each. For the list of runbooks, variables, and schedules created by the solution, see the Solution components.